Origins traced to 1809 founding of Sisters of Charity in US by Mother Elizabeth Ann Seton and subsequent 1859 establishment of Sisters of Charity of Saint Elizabeth in Diocese of Newark by Mother Mary Xavier Mehega, Academy of Saint Elizabeth, currently operated by Roman Catholic Diocese of Paterson, first secondary school for young women in NJ, founded in 1860 by the Sisters of Charity of Saint Elizabeth of NJ.with railroad station built 1870s for 200-acre Convent and Academy named Convent Station, now section of Morris Township. College with six students opened in 1899. In 1902, Sister Helen Angela Dorety graduated, continued her studies at University of Chicago to become first Sister in US to receive Ph.D.. In 2014, Sister Miriam Teresa Demjanovich, alumna in Class of 1923, beatified in ceremony in Newark's Cathedral Basilica of the Sacred Heart, first time a beatification took place outside of Vatican. Became co-educational in fall 2016 (80% female student body in 2018-19 year), in next year first doctoral students in counseling psychology received Psy.D., also launched new bachelor's programs in computer software engineering, sports management and marketing, and social work along with master's programs in applied behavior analysis, data analytics, public health, and social media design and management. Centers and programs include Center for Catholic Women's History established to collect Catholic women's stories and record the ways those women handed on their faith; Holocaust and Genocide Education Resource Center; Center for Human and Social Development community resource for individuals, families, schools, and other organizations in need of support; Center for Ministry & Spirituality for spiritual and theological formation of laity, including courses, retreats and conferences; Institute for Couples Therapy Education partnership between NJ Collaborative for Emotionally Focused Therapy to advance mission of working with underserved populations with emphasis on social justice in field of mental health. Arts and performance programs at 560-seat Dolan Performance Hall, hosts original classical music compositions, plays and lectures, Greek Theatre outdoor arena, recreation of Theater of Dionysius in Athens, for plays, concerts; Therese A. Maloney Art Gallery with exhibitions often themed on diversity and inclusion selected from local and nationally-known artists. 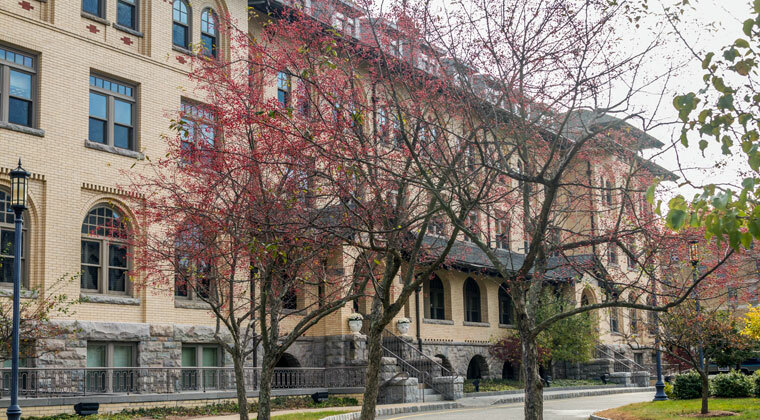 Ranked 2018 #3 among private schools in NJ on Money magazine's "Best Colleges in 2018" list; tied for #14 in US for online criminal justice graduate programs In US News & World Report "Best Online Graduate Criminal Justice Programs"; also among US News & World Report's top 15 "Best Ethnic Diversity" colleges in Regional Universities-North list of colleges where students most likely to encounter undergraduates from an ethnic group other than their own; also #8 in NJ for graduating low-income students, highest of all small private colleges.